There is little one can say about how great My Cousin Rachel is without getting into spoilers. I guess you could point out it is very well acted by its cast. You could mention directed with a flare for suspense and uncertainty as well as capturing natural beauty and contrasting that with the tension inherent in the story. And you could say that the story is just one big satisfying mystery which plays into our cultural fears while upending them at the same time. But to truly understand why you should see My Cousin Rachel you need to see it. You have been warned, spoilers from this point out. My Cousin Rachel is a treatise on men's perceived entitlement to possess women. It is quite brilliantly crafted to suture its audience into the perspective of its "hero" played by the classically handsome Sam Clafin. It plays without suspicions about the lovely, independent, and therefore devious Rachel played perfectly by Rachel Weisz. We react with Clafin seeing her in full arsenic and old lace mode. The film is structured like a thriller so a villain is necessary and must be hiding in plain sight. We are quick to jump to conclusions, trust in what the good men are telling us, only to have that all upended by the film's Shayamalan like "twist" that Rachel is not the witch we have suspected her of being at all. That the real villain is our hero, is us. Rachel does a very clever job of getting us to see our own biases towards strong women and deal with that consequence. It's a mirror held up to our sexism. From the marketing to the film's inherent style, tone, and structure, Rachel leads us down the garden path of our own making and holds us accountable for it. "Why can't I live my life the way I want?" Rachel asks and as the audience we are faced with the way we support the statement in principle yet still participate in the ways that prevent women from doing so. 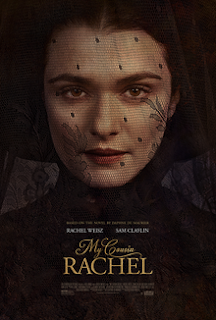 A little more direct in its indictment of sexism than the film this one is remaking, My Cousin Rachel is extremely satisfying and entertaining and leaves a bittersweet taste in your mouth at the end.